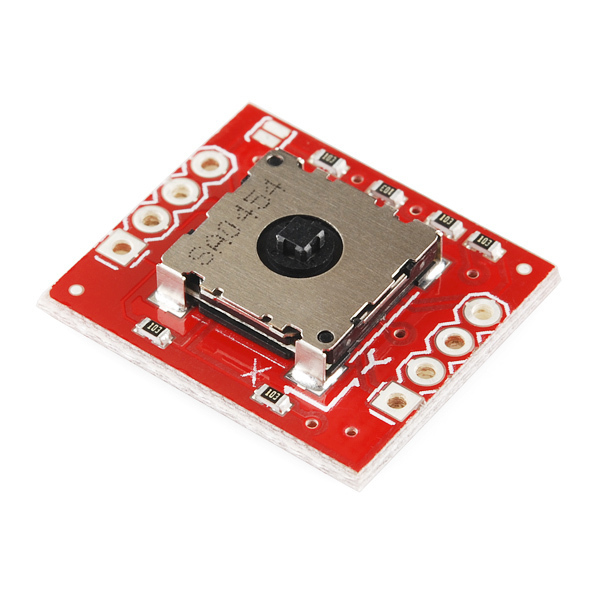 The EasyPoint™ N35P112 is a hall-effect based miniature joystick module. The integrated two-dimensional linear encoder monitors the movement of the magnet incorporated in the knob and provides the x and y coordinates via I²C output. A mechanical push button built in to the module even provides a “select” function. In other words: It's a really cool little joystick! The N35P112 Joystick Breakout makes it easy to use the EasyPoint by breaking out all of the pins that you need to get it working in your project. 0.81 x 0.72 x 0.2"
Guys.... I know we all gotta eat, it's a nice part, and I don't know what you're paying for assembly, but for six pull-up resistors? there aren't even provisions for mounting this thing. C'mon. You gotta kit it out a little more to charge this premium - Source those knobs and come up with an OTHG (Other than hot glue) mounting system. Is there a knob or something that can be put on it? No those aren't the same. this is like the ball on blackberrys and such. The link you posted is a cap for the eraser-top mouse. its just a stick that moves a little bit. It wouldn't work for this application. this is like the ball on blackberrys and such. No, this is hardly like the Blackberry trackball(er). Both are 2D, yes, and both use Hall Effect sensors, but this is a linear encoder, not a ball with two Hall Effect rotary encoders. Ah yes, I'm sorry, I didn't look at it closely enough. These are like the mice on laptops. They're not. The laptop keycap has a 4mm square opening, and the stick on this is 2mm square. Might be worth it for someone to check. The little stub looks a heckuva lot like the ones on keyboards. not that we carry, sorry. we were looking for one, but couldn't find it. wow, $10 each. that's pretty pricey! You're right though, but it's something, anyway. sure. It might be too pricey. We can check into it, thanks. An artfully worked blob of Sugru will work if nothing else. Do we have any updates on compatible thumbstick caps and where to purchase? Would it be possible to get just the N35P112. With out it soldered on to a breakout board? Not from us; I'd suggest searching Octopart to see where you can buy it. 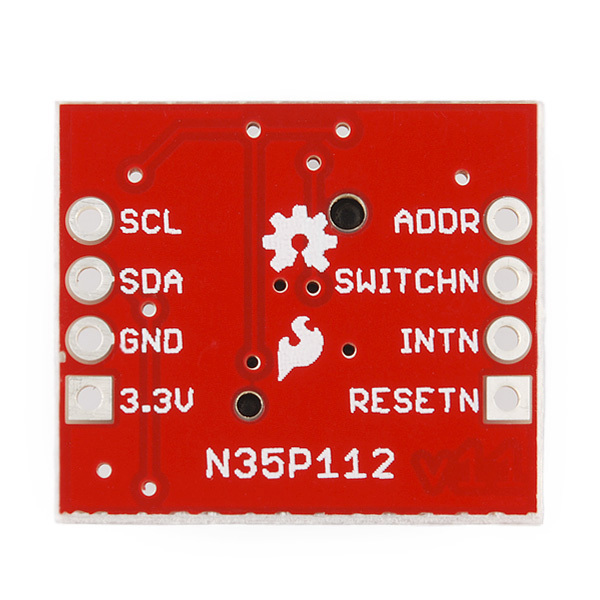 Austira Microelectronics has replacement products for the discontinued N35P112. 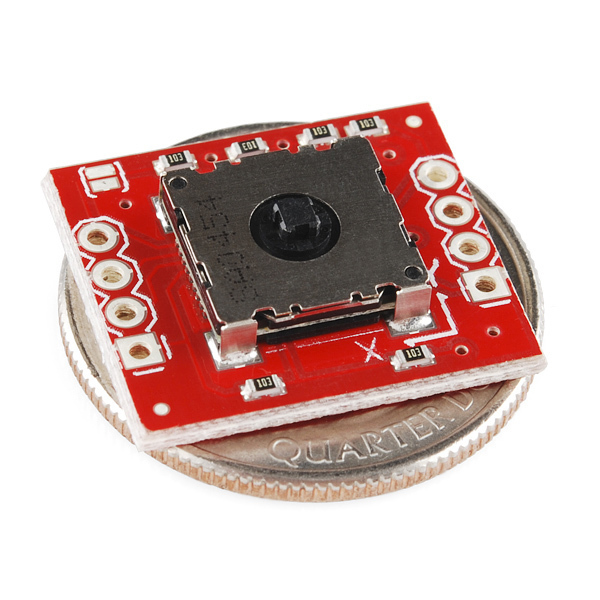 It would require some minor dev and assembly effort on SparkFun's part, to create a board to combine N40P107 or N50P105 with the AS5013 sensor chip. Could a sparfun employee comment? An email from ams (the manufacturer) states that the N35P112 is no longer available for order. 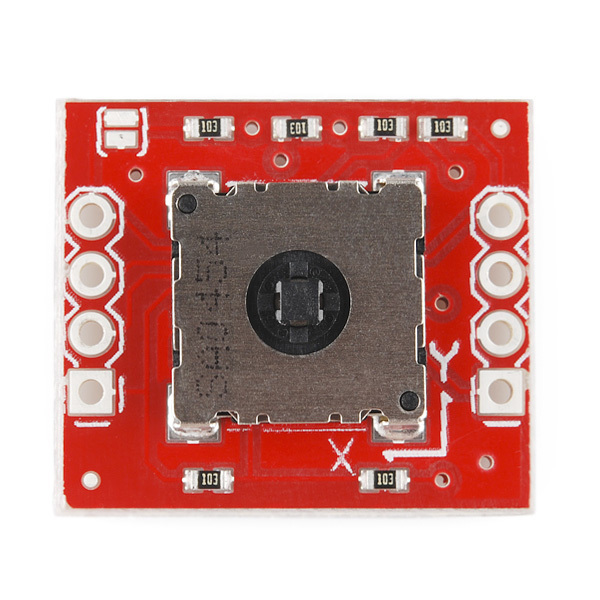 Can we expect that the remaining stock (currently 82) will be the last available through sparkfun? You are correct. We are going to run out our last remaining stock, and that will be it. Can you connect more than one of these to an Arduino UNO R3 through via IÂ²C? If yes what is the maximum number of devices you can connect? This is a 3.3V part, although I've used it at 5V with no adverse effects. That was for testing only, though- over months and years it wouldn't surprise me if that shortened its life. For best results, use our I2C Level shifter- that'll guarantee you don't break any rules with the signal levels. A 1k resistor in series with the RESETN line ought to do fine, if you need to use it. Finally, about multiple devices: there's a solder bridge on the board that allows you to change the device's I2C address, allowing two of them to operate on one bus. You only need one level shifter for both parts, of course, since I2C is multi-drop. If you need more than two, you can use multiple I2C level shifters to multiplex the signals. Just connect the VREF2 pin of each level shifter to a digital IO on the Arduino and you can turn them on and off to address the EasyPoint(s) connected to each one. Just got both the EasyPoint Joystick and the I2C Level Shifter today. I am trying to run the example code and connect the hardware in the right order. I want to connect only one joystick to the I2C level shifter to the Arduino. Problem is I am getting unreadable data on the Serial Monitor. Is this a connection issue or should I modify the example code side on this page? Thanks for the example code, I found it much more helpful than the datasheet. Come to New Zealand I i will definitely shout you a beer! Does the knob snap back to the center when let go or does it stay where its the position it was last placed in? Snaps back, but the maximum displacement is only about 1mm, so it's not terribly noticeable. What does it feel like to operate? It's like receiving a finger massage from a tiny leprechaun, singing bawdy folk songs. Or, like one of the nubbin things in the middle of a laptop keyboard. It displaces from center about 1mm in any direction, and is slightly springy. Just slightly more expensive than the Thumb Slide Joystick.